YOKOHAMA, Japan, Jan 8, 2019 - (JCN Newswire) - Mitsubishi Hitachi Power Systems, Ltd. (MHPS) President and CEO Kenji Ando delivered an address to employees, commencing the New Year. The following is a summary of the main points of his remarks. 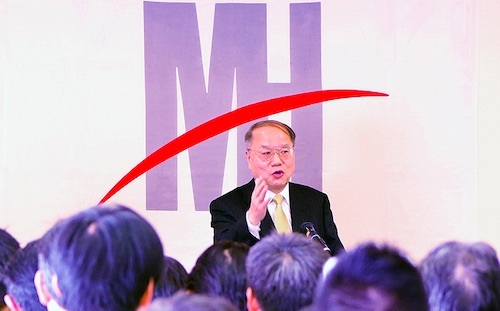 "Last year MHPS launched its new 2018 Medium-term Business Plan, taking our first steps toward restructuring business operations to deal with environmental change. The difficult business environment and turbid conditions in the thermal power generation sector remain unchanged, and our competitors are also seeing sharp declines in business results. Nevertheless, MHPS' mainstay, gas turbines, continues to hold the largest global market share, and we are gradually enhancing our market presence. Meeting the targets of the new business plan will not be easy, but I would like us all to make a concerted effort in doing so. Always bear in mind, however, that compliance remains absolutely essential. One of the important measures in the new business plan, along with maintaining existing businesses and growth in the service business, is expanding the Power & Energy Solutions business. MHPS provides new value to customers utilizing MHPS-TOMONI, our digital solution service to improve power plant operations. We have received positive results in new markets and fields of technology, including sulfur oxide (SOx) scrubber systems to meet regulations on ship exhaust gas, hydrogen gas turbines to reduce CO2 emissions, and bio-jet fuel manufacturing processes. MHPS' 54-inch last stage blade steam turbine generation facilities also began operating in China for the first time, at the Sanmen and Haiyang nuclear power plants. We will continue to accelerate our efforts in penetrating new markets and strive to surpass last year's results. Technological innovations in areas such as AI (artificial intelligence) and IoT (Internet of Things), as well as bio/nano technologies are advancing at a rapid pace around the world, and will have an impact on all industries. In addition to our business functions, these advances have the potential to significantly impact the ways in which we work. There will also likely be new goods and services spawned from these innovations that will disrupt our preconceived ideas of production and services. However, being fearful of disruptive change will only leave us behind current trends, and cause us to fail. Instead, being curious, proactively embracing changes and perfecting them, is what will allow us to remain competitive. I encourage all employees to adopt a broader perspective and break through existing boundaries. As we embrace the New Year and all of the challenges and opportunities that come with it, I urge you to be bold and act as a catalyst for change. Thank you for your hard work and continuous dedication."